Footage of a controlled rural fire burn. Aviation Safety Management Systems Ltd (ASMS) congratulates Interpine Group on the award of Part 102 certification for their UAV operations. Interpine Group is the first forestry and/or rural fire related UAV provider to obtain Part 102 certification. Privileges available under the certificate include operating at night, above 400ft AGL, over persons or property, and within low flying zones. ASMS is pleased to have worked closely with Interpine Group on their certification application. We integrated Interpine Group's existing operating, maintenance, and safety procedures together with procedures that we developed to provide a complete exposition. For more information see Interpine's post. 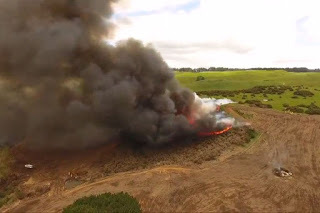 To see more about Interpine's use of UAVs in rural fire, see this post, this post and associated Youtube clip of a controlled burn.